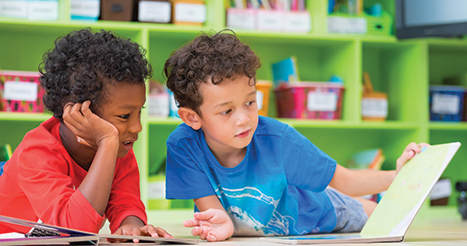 The stories of two 1st graders demonstrate why students need spaces where they can choose what, when, and how they read. Mark and James attend City Partnership School, which is located in a historically Black urban neighborhood in the northeastern United States. Like many elementary schools across the country, City Partnership uses a balanced literacy approach to reading instruction, with one pillar being the use of “just right” books. Multiple times per year, students are assessed to determine the level of text they can read with independence (Fountas & Pinnell, 2006), and this guides their teachers in helping them choose books to read. In addition to the reading instruction they receive in their classroom, Mark and James also visit the school library twice a week for “browsing sessions,” in which they can move about the space and peruse books as they wish. However, while the library gives them the chance to select and read whatever they like, alone or with others, they have less freedom than one might expect. In fact, their identities as readers have already been constrained by their experiences with leveled texts in the classroom. As literacy researcher Stavroula Kontovourki (2012) argues, it may seem perfectly innocuous to assess students and assign reading levels to them, but these actions can have powerful and lasting effects on how children think about themselves and how they are perceived by others: “[P]ractices like leveling can be understood both as products of power and as permeated by power, which students take up or resist but whose stakes are nonetheless high” (p. 168). In short, while reading levels are intended to be private and nonjudgmental, they tend not only to become public knowledge within the classroom but also to shape the choices students make outside of it. It may seem perfectly innocuous to assess students and assign reading levels to them, but these actions can have powerful and lasting effects on how children think about themselves. All too often, the language of assessment follows students into those spaces designed to be assessment-free. Ultimately, even the school library becomes a contested space, where children struggle to define themselves and their abilities in relation to one another. On one hand, the library offers pockets of freedom and choice, where students can be playful and engage in literacy in a variety of ways and with books of their choosing. On the other hand, the library is just one more place in school where kids have to contend with being leveled. Mark is a spunky, caring, and kind 1st-grade Latino student who speaks both English and Spanish, loves listening to read-alouds, and enjoys browsing time at the library. Described by his teachers as a “low reader,” Mark “browses” books in the truest sense, moving around the shelves at leisure. Over six months, I got to know Mark through interviews, observations, and informal conversations. To him, being a good reader was defined largely by what reading level you were on. When asked what sort of reading he does in the library, Mark named the things that he had been taught to do in the classroom (for example, reading and rereading hard books), and he described himself as someone who is accelerating through reading levels and, therefore, becoming a better reader. However, try as he might, Mark was still seen as a struggling reader by his teachers and peers. MARK: I can read anything. NIKKI: No, you can’t! (Quietly) He’s a level A (the lowest reading level). MARK (to Nikki): I’m not a level A. I’m a level C.
ALYSON: But what . . . ? NIKKI: I’m a level J. MARK: I’m a level D! ALYSON (to Nikki): Can you let him finish? (To Mark) What are you doing in this picture that makes you a good reader? MARK: Because I’m a level H.
NIKKI: You’re not a level H.
ALYSON (pointing to a picture Mark had just drawn of himself reading): But what are you doing in this picture? MARK: Umm, grabbing a book. ALYSON: What kind of book? MARK: Well, I’m a level O.
ALYSON (to Mark): Just ignore [her]. NIKKI: He’s a level C.
MARK: No, I’m not! I’m a level D.
With language such as “I’m not a level A. I’m a level C,” Mark articulated reading levels as the marker of proficiency. His classmate Nikki also actively took up the discourse of leveling to regulate what Mark could read, positioning herself as more proficient than him with language such as “He’s a level A” and “You’re not a level H.” These students’ emphasis on reading levels demonstrates that the library is not a space that is free from notions of leveled reading, but rather, is a space that is not that different from the more assessment-focused spaces that are integral to Mark’s daily life at school. Although he was marked as a “low-level” reader in the classroom, perhaps Mark had finally realized that the freedom of the library allowed him to interact more playfully with books and to read on his own terms. Rather than being expected to read a book at a specific level from cover to cover, he was able to take advantage of the browsing session to have a meaningful literacy experience and to feel successful, even if for only a moment. It is critical to acknowledge that Mark’s success during this event was, in large part, due to the support that I offered to his reading. However, even in short-staffed school libraries where providing this type of reading support is difficult, students should still be given opportunities to make their own book selections and determine whether a text is readable on their own. Because most of the literature that students will encounter in their lives is not leveled, the leisurely reading offered in the library gives students a chance to make their own decisions about whether a book is at an appropriate level. The leisurely reading offered in the library gives students a chance to make their own decisions about whether a book is at an appropriate level. James, also a 1st grader, is a voracious reader who loves the author Mo Willems. During each of my visits to the school library, I noticed, he would select one of Willems’ books. When I asked him why he did so, he responded: “Because Mo Willems always uses speech bubbles . . . Because they can make you understand what the person is talking about.” A polite, quiet, and sometimes shy student, James is of African descent (Nigeria and Guinea) and speaks both English and French at home. And while he is described by his teachers as an advanced reader, James is also constrained by his awareness of his reading level. When I asked James about his love of reading, he said, “I will never forget Mo Willems books.” He looked forward to his library sessions because he got to engage with these texts as he pleased, whereas the classroom had more limitations. “When I’m in the library, I always get to see Knuffle Bunny books, Mo Willems books . . .” he told me, referring to these texts as familiar favorites. For months, I observed him returning again and again to Willems, sometimes asking his peers to swap with him so that he could reread those books. It became impossible to think of James as a reader without picturing a Mo Willems book in his hand. In the classroom, where he is expected to read “just right” books, James doesn’t have the flexibility to read the books that he loves. The texts at his independent level (J and K) might be categorized as beginning chapter books, such as the Henry and Mudge series or the Frog and Toad books, which feature multiple characters, larger amounts of dialogue, and more complex plots. Books by Mo Willems are shorter (with most being level F or G), and they play with font, often using all capital letters, exaggerated punctuation, and speech bubbles, which James often acted out. ALYSON: James, when you check out books in the library, do you get to pick whatever you want? JAMES: Yes. But I can’t pick the books there or there (pointing to the teacher resource texts and the nonfiction section for older students). ALYSON: And then, when you get to book shop in your classroom, do you get to pick whatever you want? JAMES: I get to pick whatever I want . . . But I don’t get to pick everything out because we are in levels. ALYSON: Hmm . . . Can you tell me what that is like? Are there books you want to read, but don’t get to read? JAMES: I don’t get to pick them because I’m a higher level than some people. ALYSON: So, do you get to pick the Mo Willems books in your class? JAMES: No . . .
ALYSON: In the library you don’t pick out of levels, right? ALYSON: Which way do you prefer? JAMES: I prefer that we could pick any book that we want, and we don’t have any levels. Here, James describes how even advanced readers can feel constrained when not permitted to engage with the materials that are meaningful to them. In the library, James has more freedom of movement and of selection than in the classroom, allowing him to be a reader with agency as he reads a range of content, difficulty levels, and genres of text. We must remember that reading is more than a mere process of moving up levels, and that struggling readers may have limited choices when leveled books are overemphasized. The library also provides space for students to engage with the texts in different and intriguing ways. For example, later that November, James began reading to himself and then reading with a partner. As he read with a partner, he began to stretch out on the rug, then moved to get another Mo Willems book. After returning to his spot, he and his friend play-fought over the text and then chatted. James soon began reading the book, and two of his peers also began reading Mo Willems books, side by side. As James demonstrated, the library can open a space for children to resist reading hierarchies, as the students are not leveled in this space. He was able to read with friends who are not necessarily at his level because they could choose books that they all enjoyed together. For James, library is a time for choice in texts, but it’s also a space for choice in how to read, where to read, and whom to read with. Whereas the classroom is a focused time for reading with clear objectives, James illustrates how reading can have a broader definition in a space with a different ethos. Though very different readers, Mark and James both point to the ways in which the library offers them freedom. For Mark, the library has the potential to offer a reprieve from reading books at his level and gives him space to explore. For James, the library is where he revisits his favorite books, even if they are deemed too easy for him. Ultimately, however, while libraries were designed as spaces of equity, where all students can be readers, the logic of school accountability trickles down to even our youngest students, who are forming powerful notions of what it means to be a reader. As librarians, teachers, and researchers, we must remember that reading is more than a mere process of moving up levels, and that struggling readers may have limited choices when leveled books are overemphasized. For students to truly love reading and to become engaged, lifelong readers, they must have opportunities to read a variety of texts. For this reason, reading in the library should be grounded in student choice, rather than assessment-based measures. Even within our accountability and outcomes-obsessed educational climate, the real work of literacy education means finding and preserving the spaces for students to have choice, passion, and curiosity — to discover favorite authors and, above all, to enjoy the experience of reading. Allington, R.L. (2011). What really matters for struggling readers: Designing research-based programs. Boston, MA: Pearson. Calkins, L.M. (2015). A guide to the reading workshop, primary grades. Portsmouth, NH: Heinemann. Fountas, I.C. & Pinnell, G.S. (2006). Leveled books (k-8): Matching texts to readers for effective teaching. Portsmouth, NH: Heinemann. Kontovourki, S. (2012). Reading leveled books in assessment saturated classrooms: A close examination of unmarked processes of assessment. Reading Research Quarterly, 47 (2), 153-171. Originally published in May 2018 Phi Delta Kappan 99 (8), 57-61. © 2018 Phi Delta Kappa International. All rights reserved. ALYSON RUMBERGER (atr2125@tc.columbia.edu) is a doctoral candidate and research assistant at Teachers College, Columbia University in New York, N.Y.
Great article on freedom from leveling offered in libraries! This article is so informative. Thank you! At a conference, I learned about calling students “striving’ readers rather than struggling, and I like that!.